Want to breeze through NFL stadium or PGA tournament security? 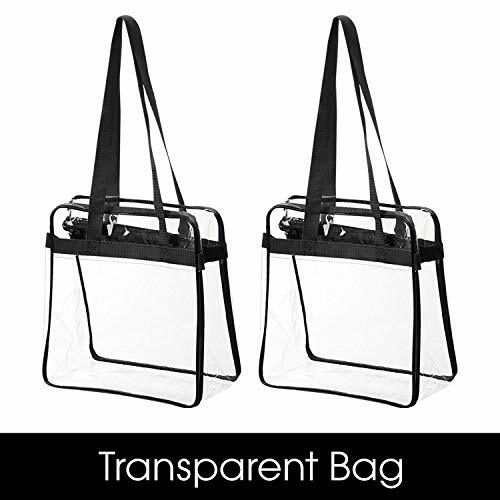 This clear tote bag is for you! This NFL and PGA security compliant bag features a shoulder strap, zip closure, and 2 outside pockets for additional storage capacity. Additionally, this 12x12x6 inch bag also meets size requirements for NBA and MLB security. Use it for the gym, shopping, beach, whatever you need! This bag is made of high strength, water resistant, transparent PVC with tubular piping. The outside pockets measure 12x8.5 inches. The handle and trim are made of black, premium woven nylon and the high-quality closure features a #5 nylon zipper. The shoulder handle is reinforced for extra strength and durability, measuring 28 inches. The bag stands on its own for easy packing and unpacking, and folds flat for easy storage. It is CA Proposition 65 Certified, Phthalate-Free. PREMIUM QUALITY: Made from high strength, water resistant PVC material. Features a durable #5 nylon zipper that will stand up to time. STADIUM COMPLIANT: 12x12x6 Transparent bag meets NFL & PGA security requirements. MULTI- PURPOSE: Use it for Events, Gym, Shopping, Beach, Travel, Work, Storage! If you have any questions about this product by Bag Boss, contact us by completing and submitting the form below. If you are looking for a specif part number, please include it with your message.